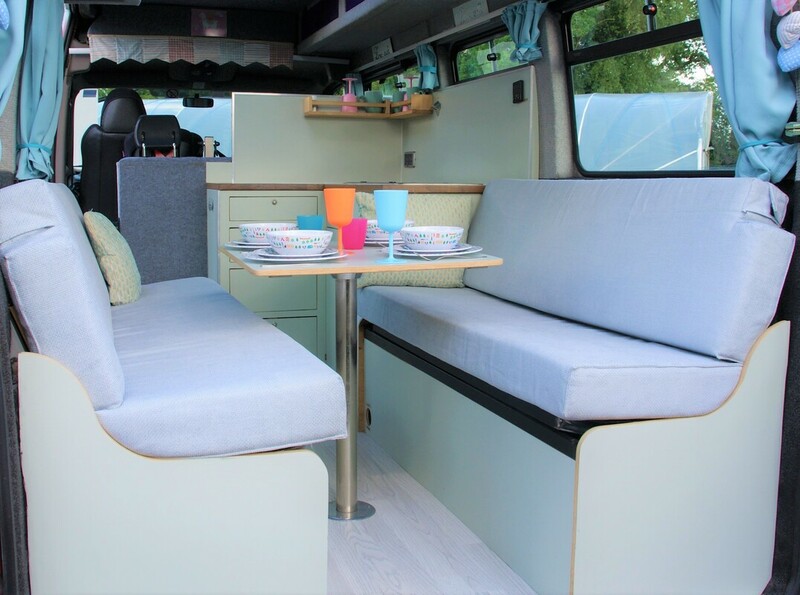 Sally the campervan - available to hire - Wanderlust Camper Co.
​sociable facing sofas and great lighting options to suit your mood. it's great for playing games on too. the grown-ups can throw open the back doors and relax on the bench sofas, which easily turn into a comfy bed when the night draws in. 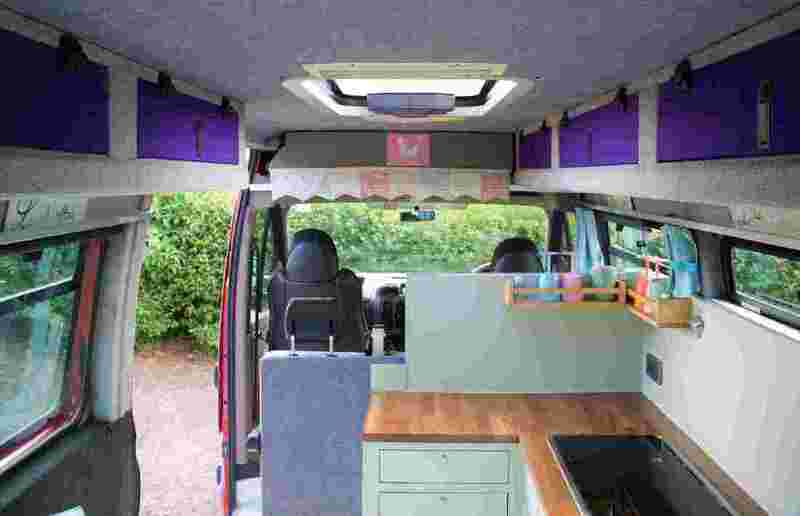 Sally has a large double bed at the rear, mad from the facing sofas. As the width is wider than a double, the bed could sleep 3. 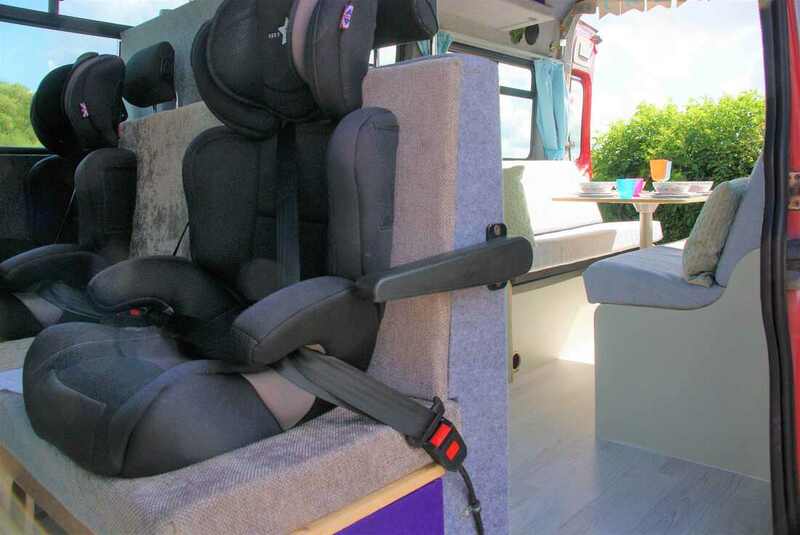 At the front, the 2nd row of travel seats provides a single bed - ideal for a grown up or kids to top and tail. 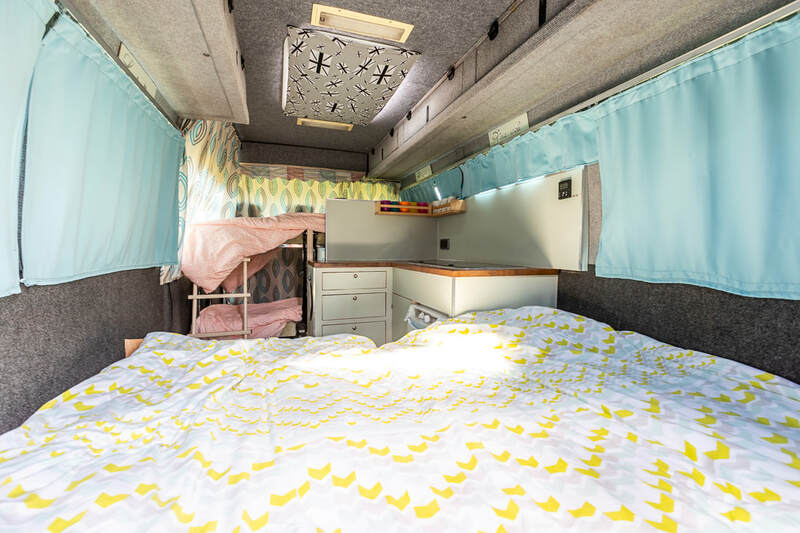 A canvas bunk above provides an additional berth if required. In addition Sally has room for a small free-standing travel cot, meaning she has several options to accommodate a family or friends sharing. There's room for a free-standing optional loo, that can tuck under the bed, when not needed. Choose from our event shelter, outdoor furniture, BBQs, fire-pit, chemical loo and eco-loo, pop-up tents, bedding and more. Additional mileage and gas cylinders can also be purchased. INSTANT BOOK for standard breaks in season. To book outside of dates offered above please enquire. Collection is from 4pm and drop-off by 11am please. We can be more flexible outside peak times with advance notice only. Handful of complimentary items: tea, coffee, sugar and cooking oil. Crockery, drinking cups and beakers, cutlery, utensils, cooking pans, chopping board, colander and mixing / serving bowl. Kettle for gas hob (an electric kettle is available with hook-up). Eco washing up liquid, dish-wash brush and washing-up bowl (if you prefer to use a sink at campsite). ​Eco multi-spray, cloth and dustpan and brush. LPG gas canister for cooking / fridge. You are welcome to use the available gas canister If you wish for a full canister, please ask as there is a small charge to provide a new full canister. Up to 500 miles included per week / pro rata. If you're planing a longer trip, we charge £40 per extra block of 500 miles. Personal belongings are covered in some instances from theft or damage in an accident up to £100, (with some exclusions, such as cash and credit cards). We strongly recommend taking your own travel insurance if you require a higher level of insurance on your personal belongings as well as possible impact on your holiday. You may wish to consider taking out insurance for holiday cancellation protection, such as if you need to cancel through illness or redundancy for example. We do not recommend certain products or insurers as you would need to take advice tailored to your personal circumstances. You may find it useful talking to the personal insurance department at our insurers - Alan Boswell 01603 218007. You may also find it useful looking at cancellation protection, such as Booking Protect (link here) . A 2001 Vauxhall Movano 2.5l. Fuel: Diesel. Manual 5 gear. MPG: 27.9mpg* - Indication only as varies with load and driving techniques / conditions. Double bed easily made from facing bench sofas. 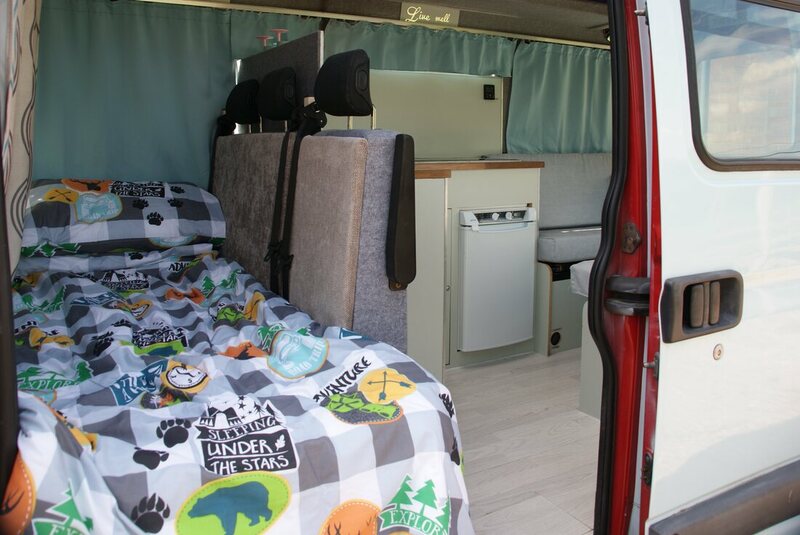 Sally's bunks are approx 55cm x 1.7m long. are extendable to be full van width. 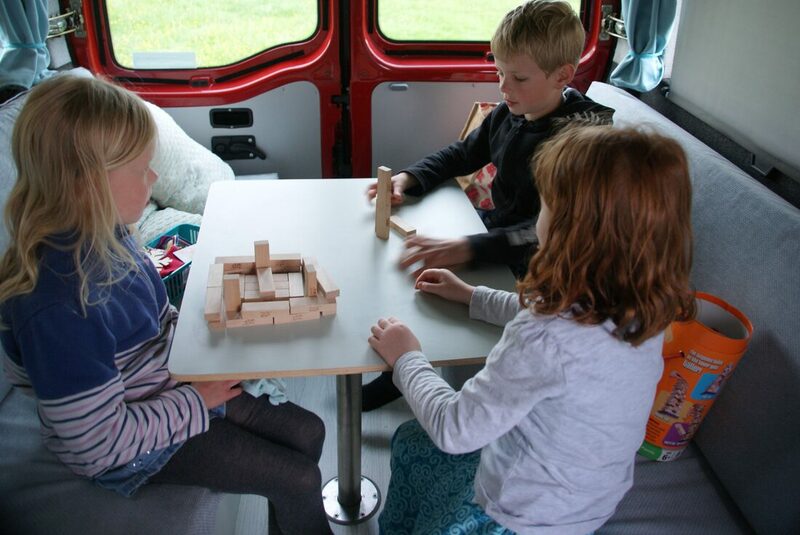 The top bunk comes with an optional bed rail and ladders. We don't recommend for children who aren't used to a bed. Reservation is not confirmed until reservation deposit is received and you have received a booking confirmation. Full payment is required within 6 weeks of collection. Safety deposit: £250 refundable upon safe receipt. Where damage has occurred the hirer is liable for a £1000 damage excess. Cancellation charge: Your reservation deposit (£150 or 20% whichever is higher) is non-refundable. If you cancel more than 6 weeks before your hire period you will loose your reservation deposit. You will loose 50% of the cost after the reservation fee if you cancel less than 6 weeks but more than 4 weeks before your hire date. 28 days or less you will loose 100% of the hire cost. 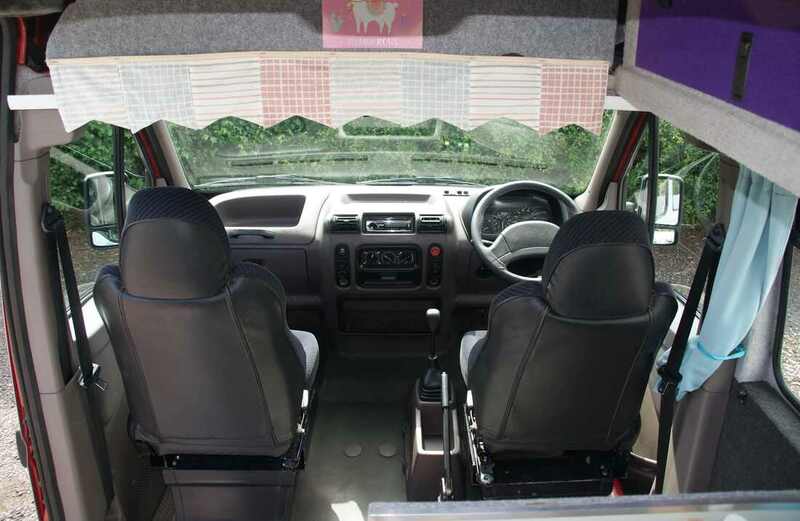 Hiring one of our campervans is deemed as acceptance of our terms and conditions. These are available on this website and before confirming your booking on our on booking page. Collection from 4pm and drop-off is before 11am, unless otherwise agreed in advance. ​Allow an hour for collection for insurance paperwork to be processed, vehicle condition report and be shown how to use the van. 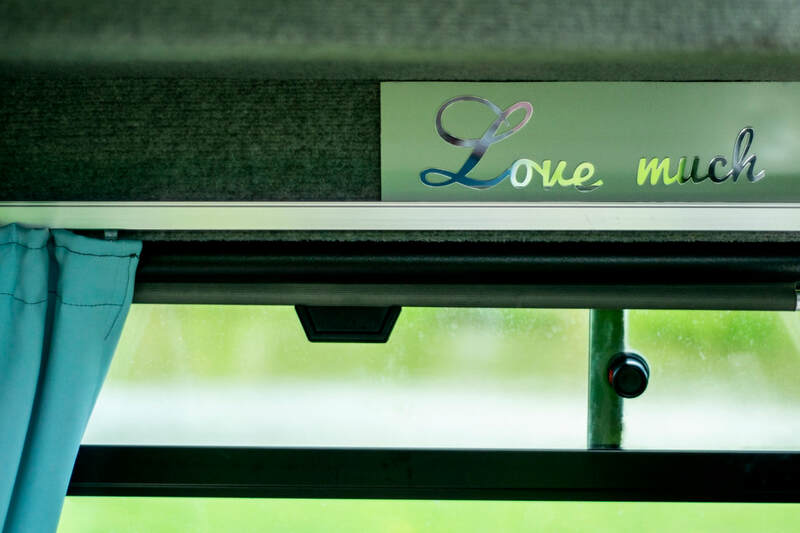 A comprehensive guide is also provided with in the vehicle. Please allow up to 20 minutes for the hand-back. Parking is available subject to availability at no charge and at the owners own risk, for one vehicle per rental. ​Gower and Cotswolds are all reached from Gloucestershire. You are welcome to take Sally around the UK. Just bring food and fun!